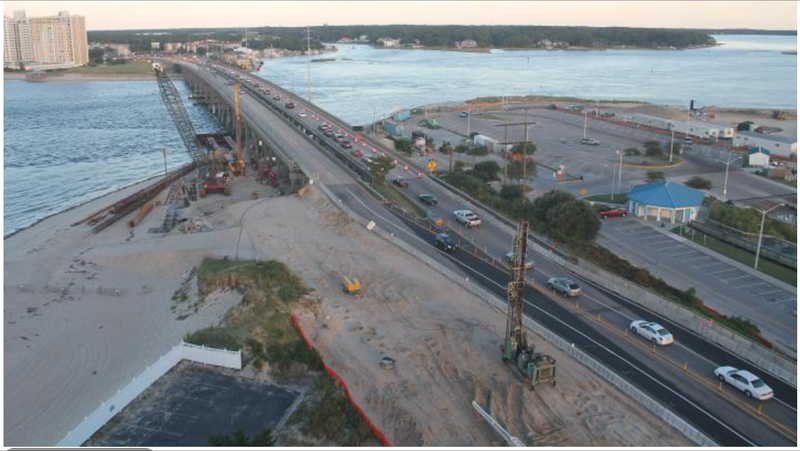 Today, Monday, September 22nd, the City of Virginia Beach directed the Lesner Bridge Contractor (McLean Contracting) to temporarily close one lane of eastbound traffic as you cross the Lesner Bridge until they could modify the recently constructed lane shifts at the Vista Circle Intersection. This single lane closure exists on eastbound Shore Drive between Vista Circle and the eastern bridge abutment. Emergency work to improve the lane alignment at this intersection will continue through early Wednesday morning 9/24/2014. The current schedule is to excavate material from the shoulder in front of Starbucks today, place asphalt tomorrow afternoon, and complete the pavement remarking tomorrow evening. We offer a special thanks to all of the citizens that made us aware of this situation at Shore Drive/Vista Circle.